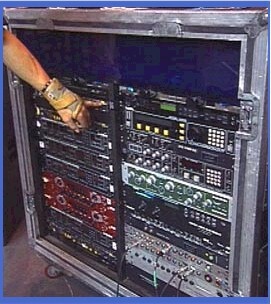 Lyle: You can duplicate many of the Edge's fx settings with your own signal processors. 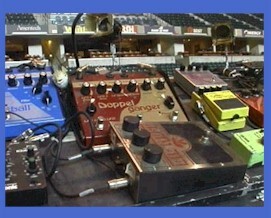 Lyle: The Edge uses many old stomp boxes from his early days so he can still reproduce the same sounds live. 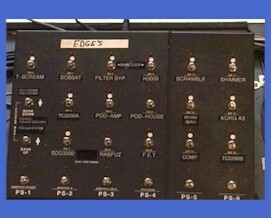 Lyle: Above is a picture of his switching system near his mic stand. All of his rack fx and all these stomp boxes are used to create the sounds you hear on all of U2's music and live shows. 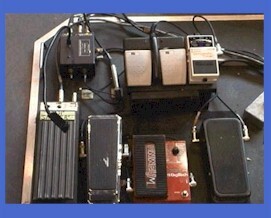 Lyle: In this picture you might see a couple pedals you know. The white pedal is a Boss tuner. 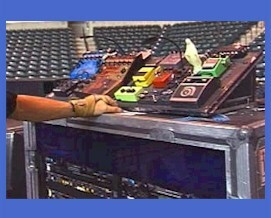 He's got a wha, volume, Digitech whammy and a couple of switches for turning the keyboards on and off during live shows. 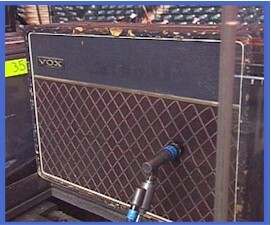 Lyle: The Edge uses Vox amps to drive the signals from all these fx. His favorite is a '64 Vox AC30. Lyle: He plays mostly Gibson and Fender guitars. Gibsons for the fat crunch, and Fenders for the cleaner sounds. Lyle: Turn the output of the delay fx up loud to match the guitar signal. What is happening here with the jam track at 125 beats per minute (bpm) and the delay set for 360 ml, is a dotted eighth note repeat. A very cool sound. Lyle: You can hear the effect that the echo has at this tempo. Lyle: This next example is the D major scale using this echo effect. 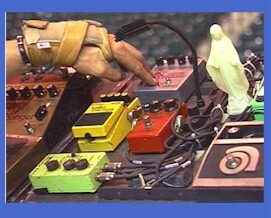 Lyle: Van Halen used this type of effect in a solo called "Cathedral". Also David Gilmour used this effect on the song "Run". Lyle: Here's an arpeggio of the D major scale. An arpeggio is made up from the chord tones of the scale - 1st, 3rd and 5th notes of the major scale. Lyle: These have been just examples of the delay effect used by The Edge on a song that sounds like this. Play around with your settings on your signal processors and in the next lesson we'll get into chord progressions and rhythm techniques. Remember to set your delay to 360 mil and about 4 repeats that are loud, and jam to the looping sound clip in the key of D.